The existing breed record of 2,600gns was equalled by the champion at the Northern Area Jacob Sheep Breeders’ show and sale at Skipton. The gimmer lamb, from Tony Reilly’s Deerpark flock, East Lothian, was shown on his behalf by Robert Locker, Greenlaw, Scottish Borders. Mr Reilly was dispersing his sheep, having been diagnosed with a terminal illness, and unfortunately died the day after the sale. The champion, bred by Wyn and Siwam Harries, Llandeilo, was bought by the judge Gordon Connor for his and Scott Dalrymple’s jointly owned Dun Mor flock, West Lothian. 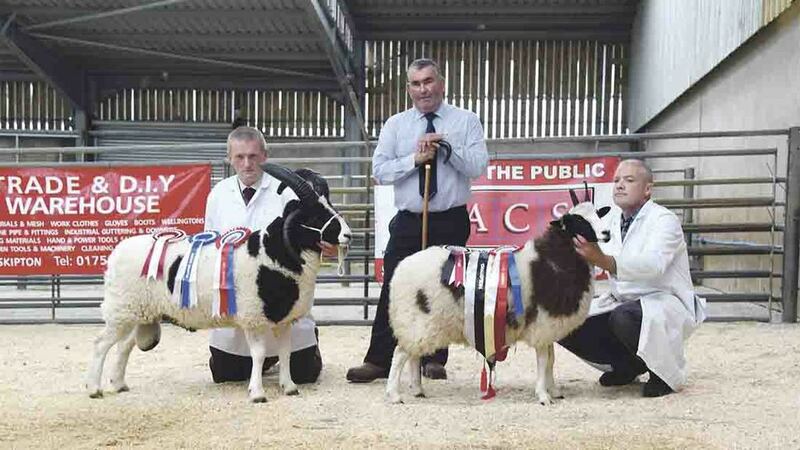 Four sheep changed hands for 1,000gns or more. Second top price of 1,200gns came for the second prize ewe lamb from North Yorkshire’s Stephen Dodsworth, also bought by Mr Connor. Mr Dodsworth showed the male and reserve overall champion, a shearling ram by the same sire as his ewe lamb, which sold at 580gns to R.E. Blacknell, Stafford. Jean Price, Churchstoke, Powys, made 1,100gns for her first prize ram lamb and reserve male champion, which had been reserve champion at Royal Three Counties and Royal Welsh shows. It was bought jointly by Gavin and Becky Haworth, Skipton, and Robert Locker, who together run the Blackadder flock as well as their own flocks. Mrs Price’s husband Robert took 1,000gns for his first prize shearling ewe and reserve female champion, which sold to R.M. Burnley, Mirfield. Howard Walsh, Preston, sold his second prize ram lamb at 900gns to Ewen MacMillan, Glasgow.